A Desaturase is an enzyme that removes two hydrogen atoms from an organic compound, creating a carbon/carbon double bond. Insulin also up-regulates these three genes in the Sertoli cell, while SCD1 mRNA is down-regulated by both insulin and dexamethasone. FSH. FSH seems to be a key regulator of the desaturase expression in the Sertoli cell. testosterone has no influence on the desaturase gene expression. DEsametasone. As opposed to what is shown in liver, Delta5- and Delta6-desaturase mRNA levels in Sertoli cells are up-regulated by dexamethasone. Hum Mol Genet. 2006 Jun 1;15(11):1745-56. Epub 2006 May 2. Schaeffer L, Gohlke H, Müller M, Heid IM, Palmer LJ, Kompauer I, Demmelmair H, Illig T, Koletzko B, Heinrich J.
Fatty acid composition in membranes plays an important role in cellular processes and has shown to be associated with the aetiology of several complex diseases in humans. We report strong associations between variants in the human delta-5 and delta-6 desaturase genes FADS1 FADS2 and fatty acid composition in serum phospholipids. Eighteen polymorphisms located in this gene cluster were genotyped in 727 adults from Erfurt, a German centre of the European Community Respiratory Health Survey. The cluster is located at chromosome 11q12-11q13.1, a region repeatedly found to be linked with atopy and other complex diseases. Polymorphisms and statistically reconstructed haplotypes of FADS1 and the upstream region of FADS2 showed strongest associations with the level of the direct precursor of inflammatory eicosanoids, the n-6 fatty acid arachidonic acid (C20:4n-6), also strong associations with levels of the n-6 fatty acids C18:2n-6, C18:3n-6, C20:2n-6, C20:3n-6, C22:4n-6 and of the n-3 fatty acids C18:3n-3, C20:5n-3 and C22:5n-3 (P-values < 1.0 × 10(-13)). Carriers of the rare alleles of several SNPs and their respective haplotypes had a lower prevalence of allergic rhinitis and atopic eczema. No association was found for total and specific IgE(IgE) levels. Stearoyl-CoA + 2 ferrocytochrome b5 + O2 + 2 H+ = oleoyl-CoA + 2 ferricytochrome b5 + 2 H2O. 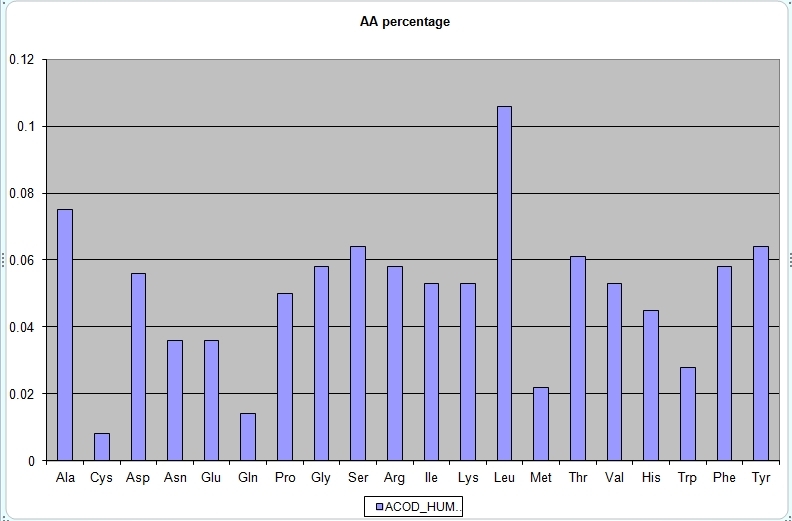 ACOD_HUMAN has an high glu/gln ratio, greater than 2.5 but low single values for glu and gln. In the study Low-temperature-induced desaturation of fatty acids and expression of desaturase genes in the cyanobacterium Synechococcus sp. PCC 7002, we cam see that the effect of hypothermia is a reduction in the extracellular glutamate level.